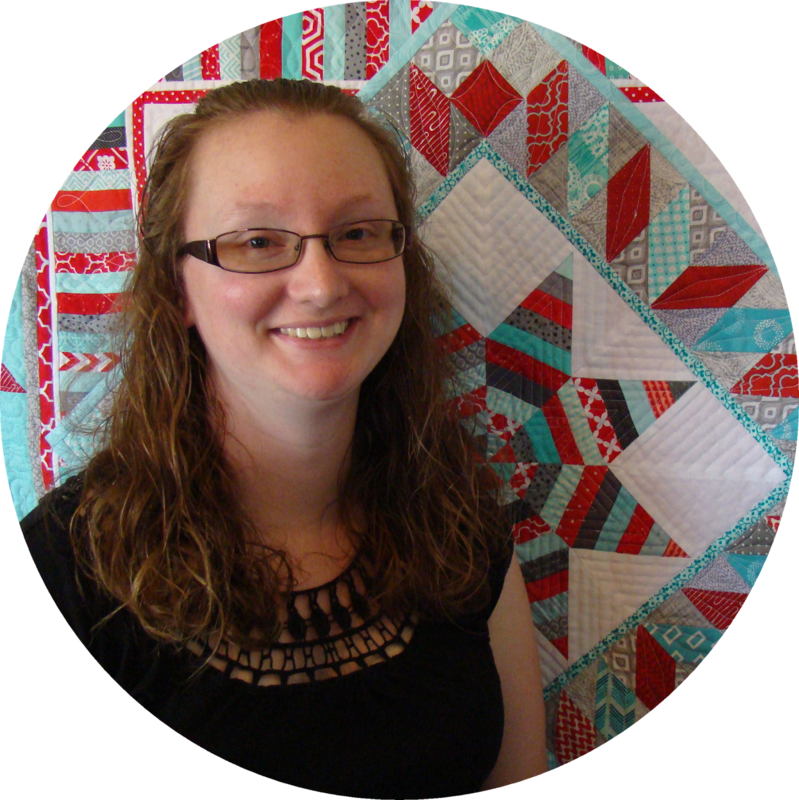 This week is International Quilt Market! 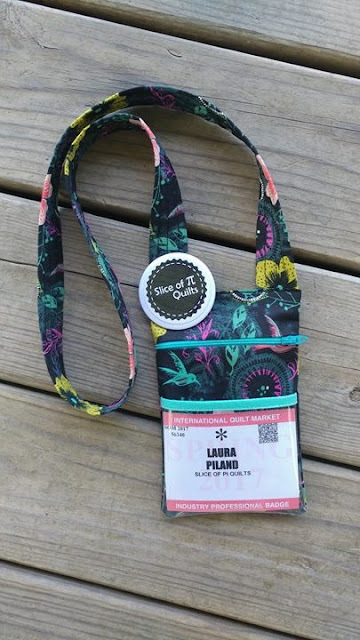 Quilt Market is an industry trade show where quilt shop owners, designers, and quilt-related businesses all gather to learn about all the latest and greatest gadgets and designs. The show happens twice a year, and this spring it is in St. Louis - and I get to go! 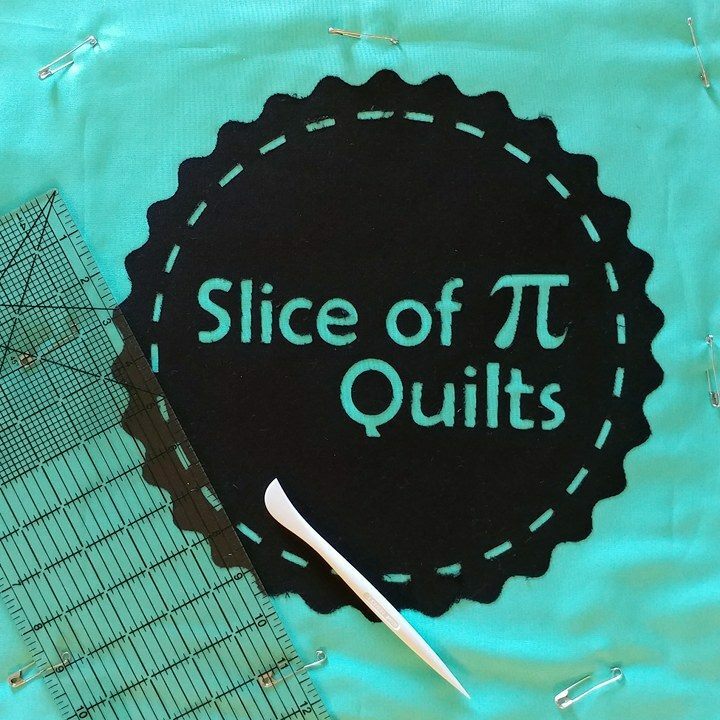 I've been brainstorming ways that I can make the most of my time at Market, and so that has led to some fun sewing projects! 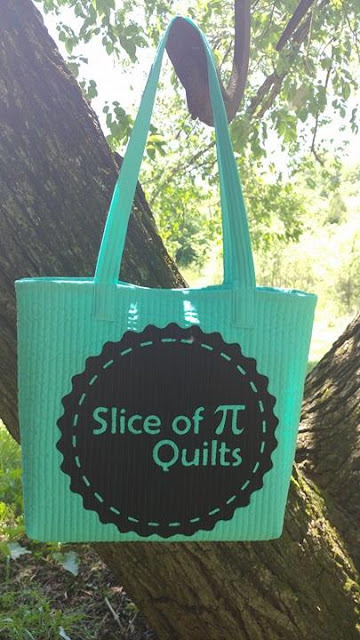 My first project was a quilted tote with my business logo on it. I wanted everybody at Market to be able to see me and know who I was even from afar - like a walking billboard! I have made several of these quilted totes before. 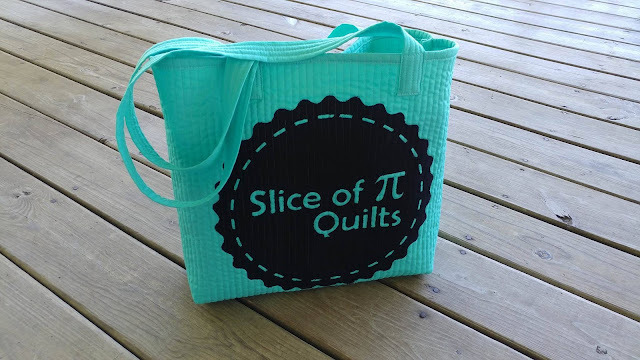 It's a very quick tote bag. I should make a tutorial for it! Maybe after Market! 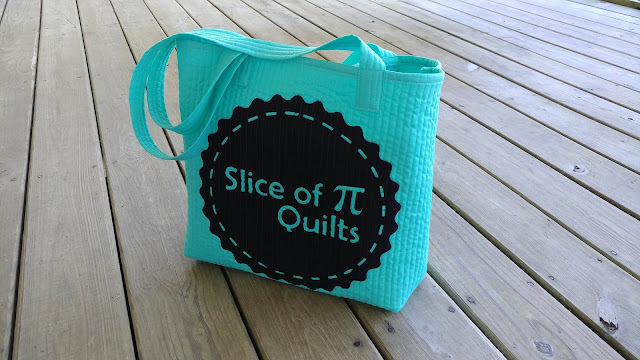 I used my Cricut (I have this one) to cut out my logo from black fabric, then ironed it onto the teal/aqua fabric. 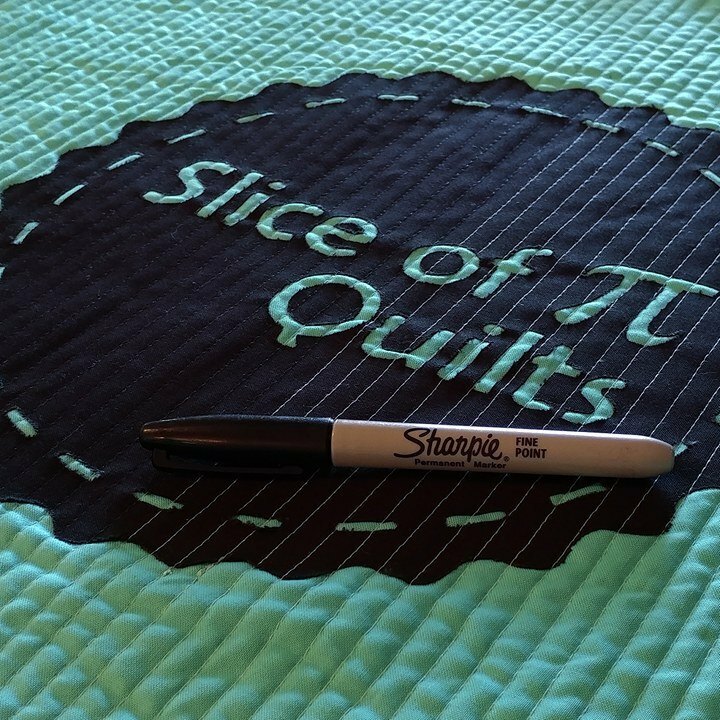 For quilting, I knew I wanted vertical straight lines. However, I couldn't decide between black or aqua thread. I really just wanted to use invisible thread, but I didn't have any on hand and didn't have time to order any. So I thought WAY outside of the box! I quilted it using aqua thread in straight lines using the walking foot on my Juki TL-2010Q. Then I used a black Sharpie to color over the light colored stitches on the logo! Call the quilt police!! 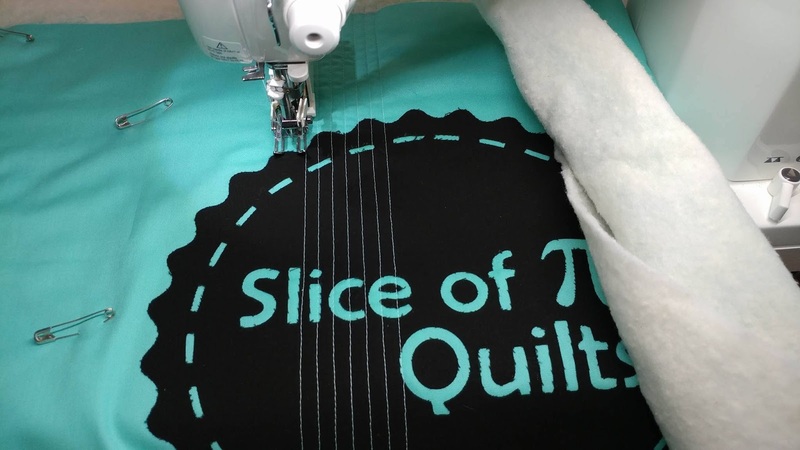 I love how the stitches blend in now - both on the aqua fabric and on the black! I'm not sure how the Sharpie will hold up over time, but for now, it looks good! 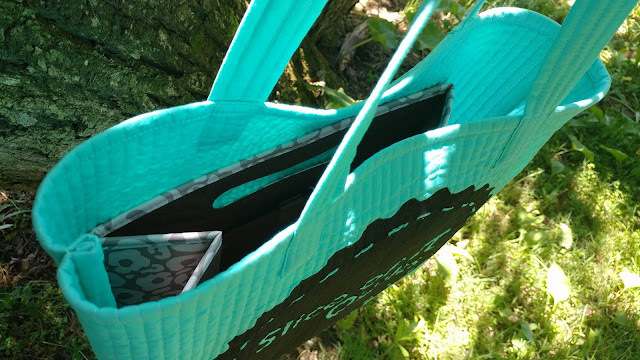 I also got a 31 Bags brand "Fold-N-File" to carry inside the tote. Not only is my bag a walking billboard - it's also a walking office! The Fold-N-File provides enough structure that I'll easily be able to carry business papers and my patterns without fear of them getting crushed or wrinkled. The Fold-N-File doesn't have room inside the tote to expand fully, but it still provides the correct length for a file folder. I'll be able to also carry some marketing materials, a water bottle, and any other information I pick up while at Market. I love that the vertical straight line quilting and the Fold-N-File allow the bag to stand up completely on it's own when I'm not holding it! The logo seems lower on the bag than I had originally planned (forgot to take into account the boxed corners on the bottom!). 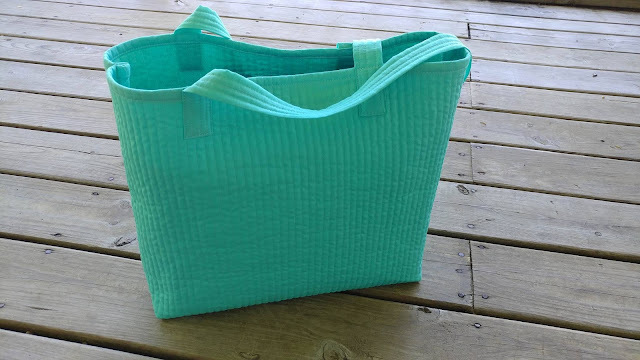 However, when I carry the tote, my arm covers the top of the bag. The lower position of my logo actually allows the whole logo to be seen without my arm being in the way! I'm hoping that the bag will be easy to spot and will stand out at Market. 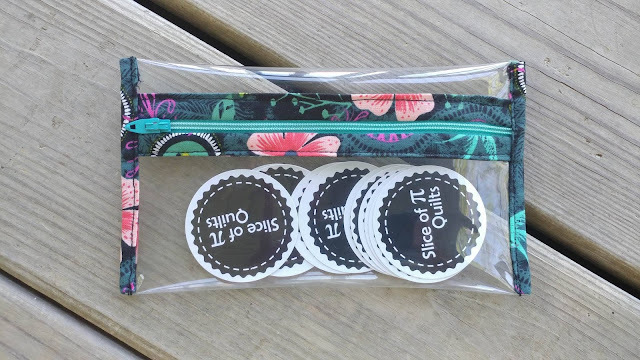 I also think it will be perfect for staying organized with both my own business items and those that I pick up from others. My second project was a name badge holder. 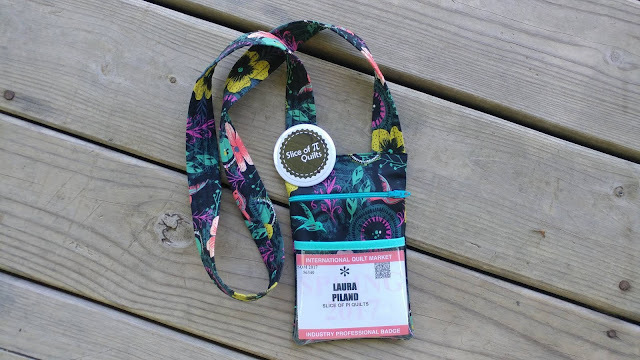 While at Quilt Market, you have to wear a name badge - so why not make it look pretty?! I absolutely love this Cotton + Steel print from Sarah Watts' Honeymoon line a couple years ago. I made sure to stock up, so I have quite a few yards of it still on hand. I didn't use a pattern for my badge holder - I just winged it! And there's a zipper! I'm still shocked it worked! The front has a zipper that opens to the inside where I can keep my hotel room key, money, etc. 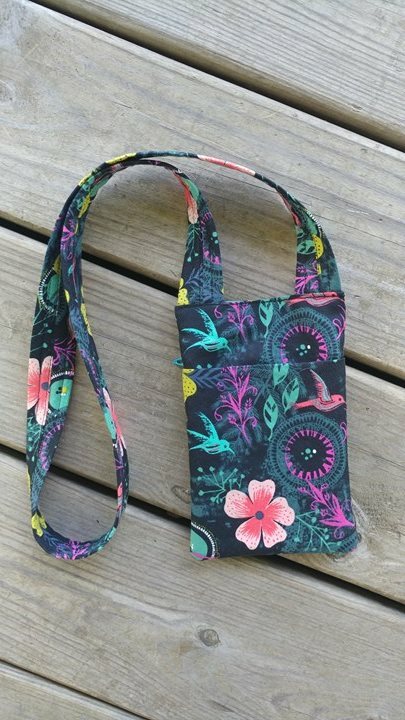 The back has a large pocket that is the perfect size for my cell phone (can't get a picture of that when I'm using my phone to take the pictures! Ha!). 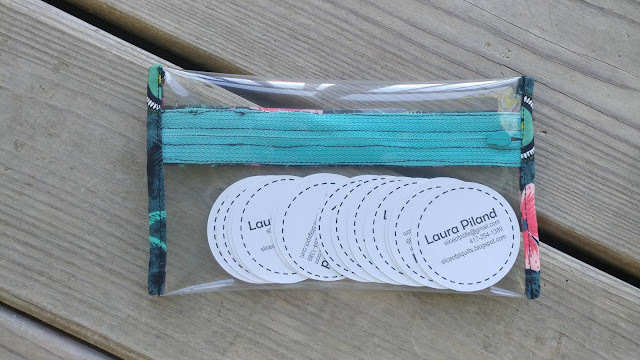 I used clear vinyl with a bit of the Honeymoon fabric to make a clear zipper pouch to hold my business cards! Again, no pattern, I just winged it. My bag-making inexperience is definitely showing with this one! 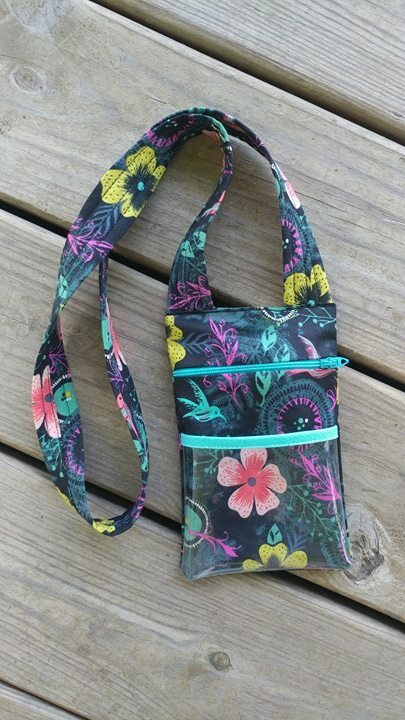 It's sewn as a loop, but I wasn't sure how to sew the second side on without sewing all the way through the pouch. I made it work, but I'm sure it wasn't the "right" way! 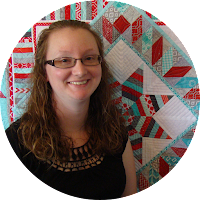 I'm so excited for Quilt Market! I'm hoping to make connections and meet with potential buyers to help continue to grow my business! With just two days left, I still have a few things left to do before I'm ready! Be sure to watch Facebook and Instagram for photos while I'm at Market! 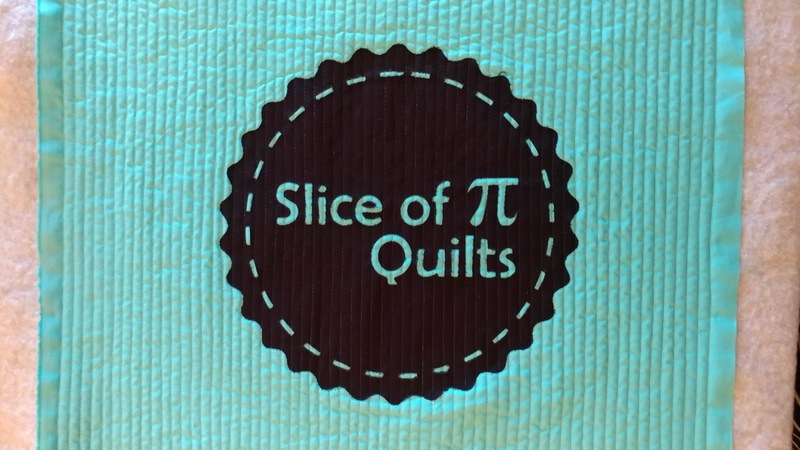 And please let your local quilt shop know about Slice of Pi Quilts! I love your bag! It's such a great idea to have something you need anyway be advertising your brand at the same time. Hopefully it will help you make some meaningful connections. Have fun at market! Have a great time! Folks will know who you are -yeah! Wishing you all good things on your journey. The sharpie was a perfect solution. I hope you have a great time! I'm going woefully unprepared,(no totes or badge holder for me) but so excited I can't stand it! :) I love your bag and the fact that it's an advertising board for you - it's sure to get lots of attention. Yay! I'm looking forward to meeting you Laura! Your bag looks great! 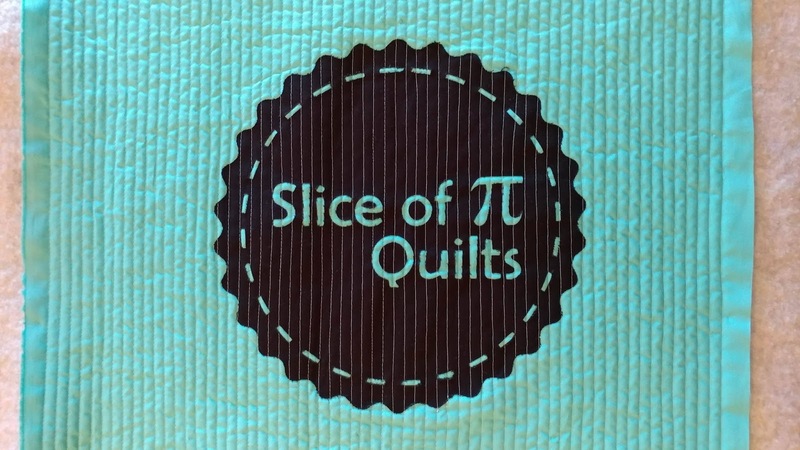 Love the color, the logo and the quilting. Best wishes for market!!! Have a great time. I look forward to reading your updates! I am really quite envious that you get to go to quilt market, have a lovely time. You are certainly well prepared. I hope all goes well for you and good luck!